VILLA HILLS, Ky. — STEM: science, technology, engineering and math. It’s more than just a buzzword among educators. There’s a whole group of them at Villa Madonna Academy High School, and the students are transforming ideas into reality, according to chemistry and physics teacher Mark Wolff. The Makers Club, open to both Villa’s junior high and high school students, began this year. A donation of a 3D printer got the group started. A subsequent donation of funds from the school’s annual fundraiser, which was held last month, will expand it. 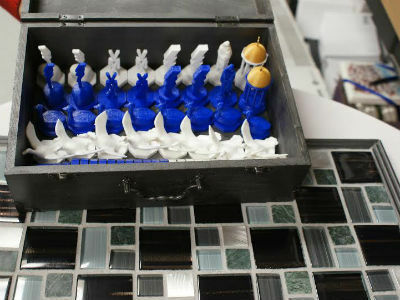 The Villa Madonna Academy Makers Club created this chess set with a 3D printer. “Villa has really revved up its STEM program,” Wolff noted. The teacher, himself, is part the high school’s plan to step up its STEM-related offerings for students. When the new school year begins this fall, he will be teaching a new engineering course – the first of its kind at Villa Madonna. The plan also includes a summer robotics camp, in partnership with University of Louisville’s J.B. Speed School of Engineering, and a newly designed “maker’s space,” with added technology, in a portion of the high school’s library. It will serve as the new home for the Makers Club and be used as a STEM lab for students, Principal Pam McQueen said. “We did a ‘Fund the Need’ request at VillaRama, our annual fundraiser, and we have more than $15,000 for our STEM program,” she said. STEM learning helps strengthen students’ problem-solving skills and requires higher-order thinking, McQueen said. “That carries over for all of our courses,” she added. For students involved in the Makers Club, acquiring those important life skills comes with the territory when designing and creating something unique, sophomore Zachary Stringer said. “It’s interesting to see the process of creating something on a computer and transforming it into a physical object you can hold in your hand,” Stringer said. The club has created a variety of items since the start of the school year, including a Villa Madonna Academy-themed chess set that was auctioned at the recent school fundraiser. Currently, the group is working on a turntable that will aid in their creation of a full-body scanner to work with Microsoft’s Xbox Kinect technology. They have also created some learning tools, including a physical representation of elements from the periodic table for chemistry students, and a map of the solar system. As more students see their creations, more of their classmates are expressing interest in the club, according to freshman Hannah Hassoun. School administrators are also hoping the school’s added investment will help draw students to science, technology, engineering and math. Creating a STEM program ties with the school’s mission and will enhance students’ experience at the school, McQueen said. Funds are also being designated to expand the STEM program at Villa Madonna Elementary School. Several STEM initiatives have already been accomplished at both schools, including the establishment of robotics and programming enrichment.